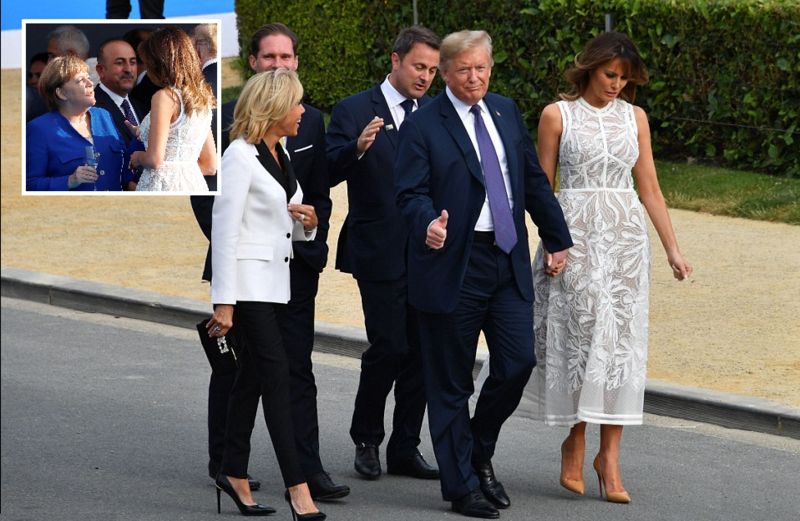 NATO leaders were invited by the Belgian Prime Minister Charles Michel for summer cocktails and dinner in the Brussels Park Cinquantenaire where it was once again FLOTUS who stole all the attention appearing in a white summer dress from Elie Saab. The lush green park next to the European Commission buildings was reserved for the evening part of the NATO summit where world leaders gathered for drinks and dinner. First Lady Melania Trump, who also speaks German, could be seen chatting at length with German Chancellor Angela Merkel as President Donald Trump talked to NATO Secretary General Jens Stoltenberg. A jazz band played as the French first couple of President Emmanuel Macron and his wife Brigitte also arrived. Whilst waiters carried in trays with wine, neither President Trump nor First Lady Melania could be seen drinking alcohol. The park Cinquantenaire, designed at the turn of the 20th century, was used as a backdrop for a photo of all 28 NATO heads of state to which Mr Trump insisted Melania would also join. The evening part came after a tense day as the US President insisted during a morning breakfast with NATO Secretary General Jens Stoltenberg that other countries needed to increase their defense spending to match that of the US, as he thinks it is ‘inappropriate’ for the US to be protecting Europe if they don’t spend on their own defense. That demand came after US President Donald Trump slammed Germany for spending just a ‘little’ over 1 per cent on defense. He also stated Ms Merkel was a ‘captive’ of Russia as her country signed up for a German-Russian pipeline project. Our President continues to do a great job. Exactly what he should be doing using economics to prevent war and if it must come to put the US in position to actually win a war despite every other branch of government and our propaganda media. How to tick off a Liberal-Socialist? Demand they honor their promises and pay their equal share for something.